The weather is terrible in Singapore now. as we have been receiving thick haze from Sumatra on most days for the last month. I was rather hesitant to let the kids go to school today as the PSI was climbing again, but I believe the schools will take care of them as they have many measures in place for haze situations. So I sent each one of them off with an N95 mask. I'm so thankful that there's at least one kid I don't have to worry about - my Mouse, who is homeschooled through kindergarten. Also, I amended one of the weather icons in his Everyday Book to "Hazy". I can certainly tell you that at the the end of this month, that will be the most common weather. Phew... Now that exams are over, I feel rather drained but much lighter. Here's what we covered this week. We jumped to Unit 10 and Unit 15 of the You Can Read series as most of his well-loved books have these words in them. That's one thing I like about this series - you do not have to do do them in order. Revision on number of sides in each shape. I also found some free number Join The Dot pages for him to do. 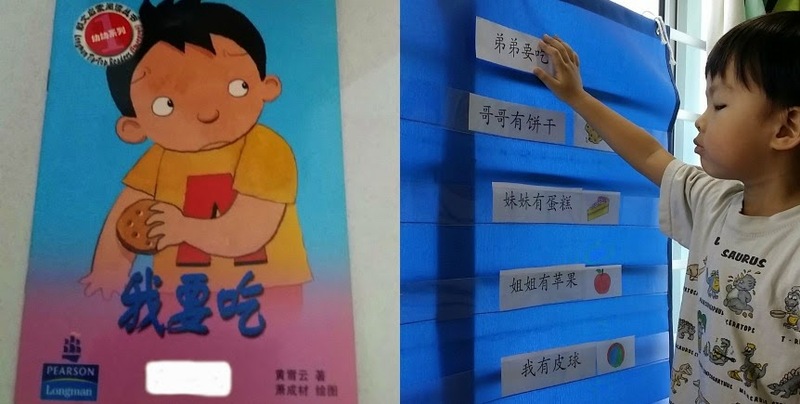 This is a Chinese reader from RM's kindy days. Mouse has been reading it with us since he was three so he has memorised most of the storyline. 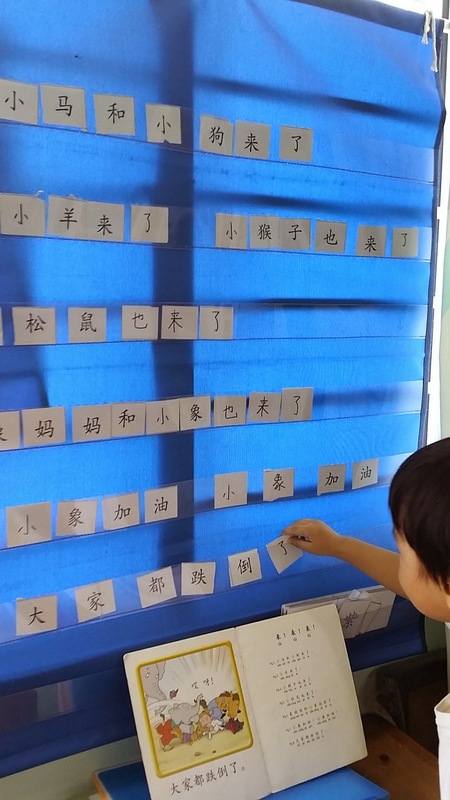 I brought it to the next level by preparing some sentence strips for the pocket chart. New Daily pages! One of which is also an extension of the unit. 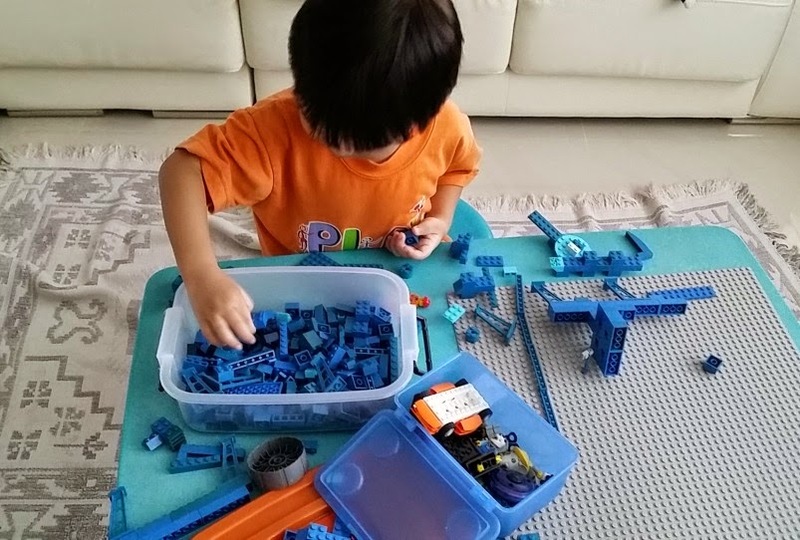 I'm so glad this boy has taken to Legos, unlike his older brother. He actually started playing with loads more after we sorted all our Legos by colour. 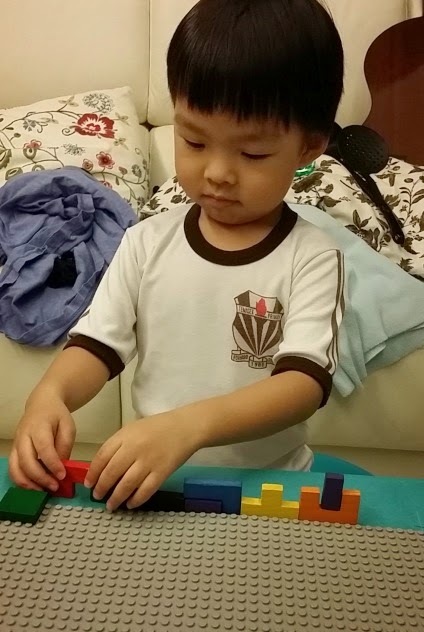 Currently, his favourite builds are guns (gasp) and spaceships. And the holidays beckon! I intend to school him for a couple of weeks into the June hols to make up for the time that I wasted earlier this year. 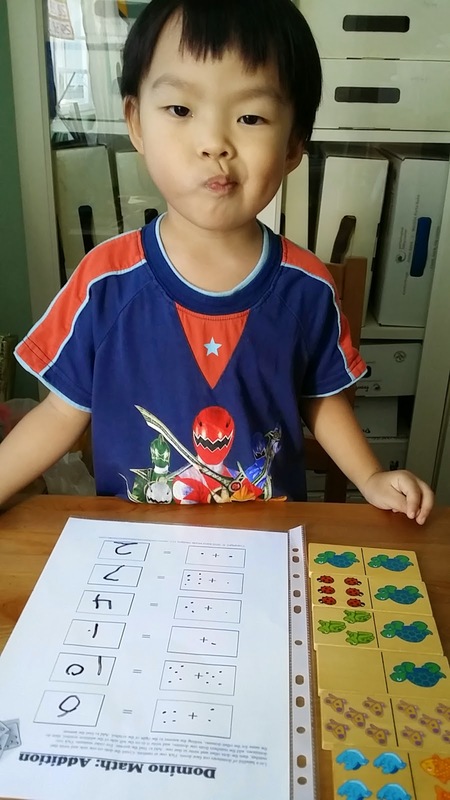 However, we shall have to wait and see because in the past, whenever his siblings were around due to illness or whatever, he was unwilling to do school. Not much time to blog. Intense revision for RM's exams! Stress stress stress! We move on with Unit 9 of You Can Read from 1+1+1=1 as well as the -OP family unit. 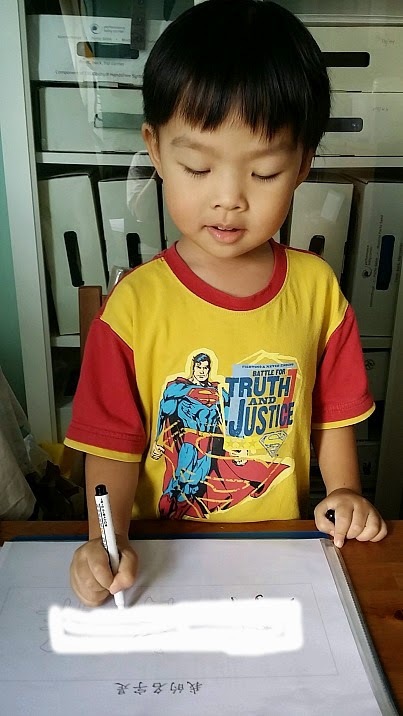 He actually knows how to pronounce "op" already, thanks to our copy of Dr Seuss' Hop On Pop (that taught our three children how to begin reading), but I figured it would be good to squeeze in some writing practice and reinforcement. 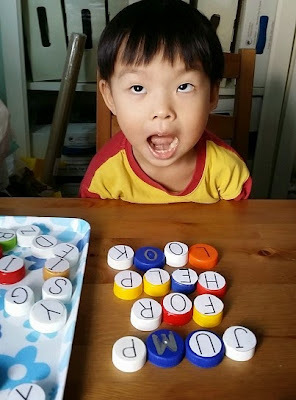 Word building with bottle caps - what a priceless face! Surprisingly, we covered lots of Math this week. 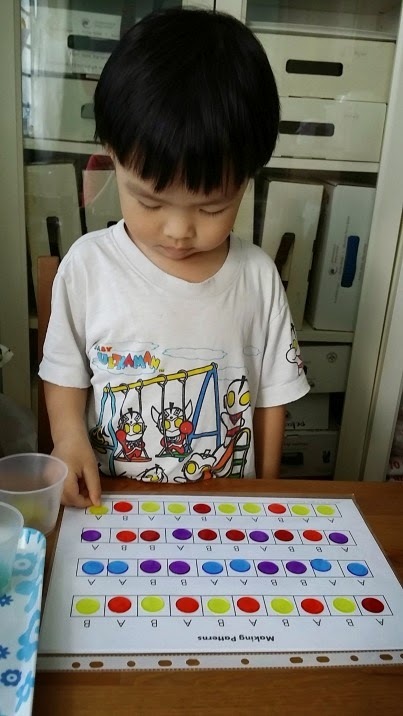 Beginning with Ordinal Numbers reinforcement, he worked on some printables from Activity Village UK. Addition: Domino Math worksheet that he first did two weeks ago. 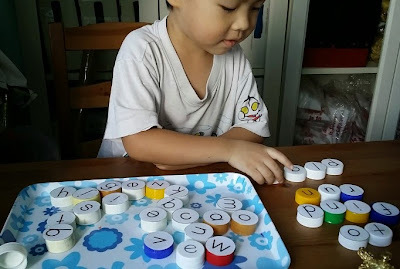 I have to look for other printables or activities because he's getting rather tired of using the same few ones over and over again. Skip counting: I'm really thankful that he's caught onto the idea of skip counting (we call it "counting by twos, fives, etc). He's even able to identify it on his own in random things we come across, such as block numbers and posters. This Hundred Board is from Primary Junction. The page also teaches you HOW to teach children skip counting and the free printable includes many types of activities. Even / Odd Numbers: From here, we moved on to even and odd numbers. 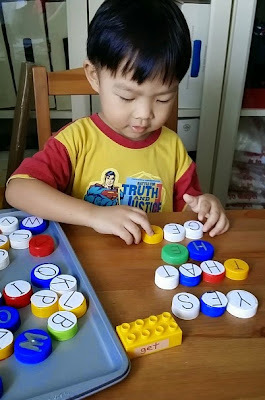 After counting by 2s (using transparent counters to mark the numbers), I gave him some glass beads and had him mark the other numbers. Then he learnt that numbers ending with 1,3,5,7 or 9 are odd numbers. 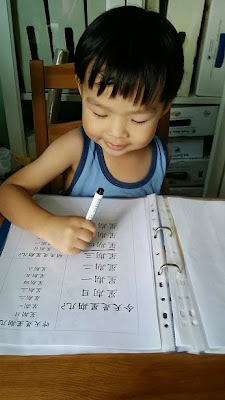 I added a new sheet in his Daily Notebook under the Chinese section - his Chinese name writing practice. 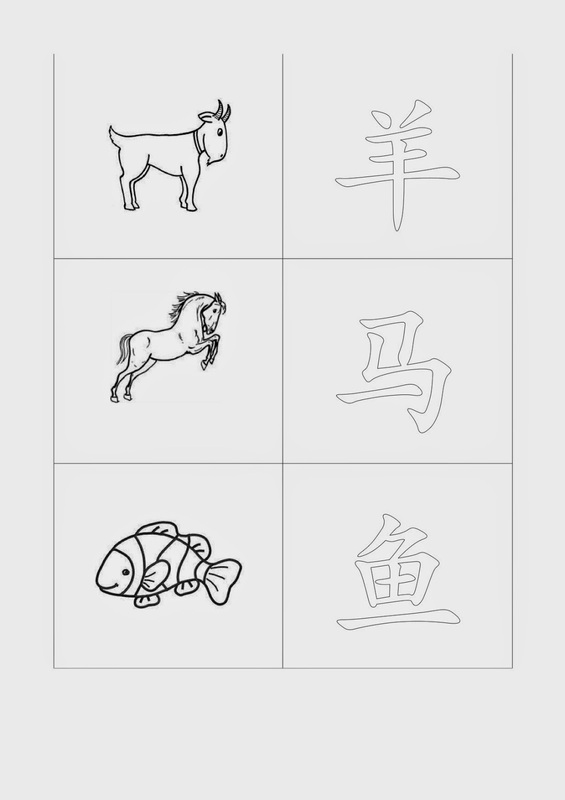 I also made some pocket chart printables for things we see in the sky for him to learn. I intend to expand this into a mini Thematic Unit, but will have to find time for it later (after exams). 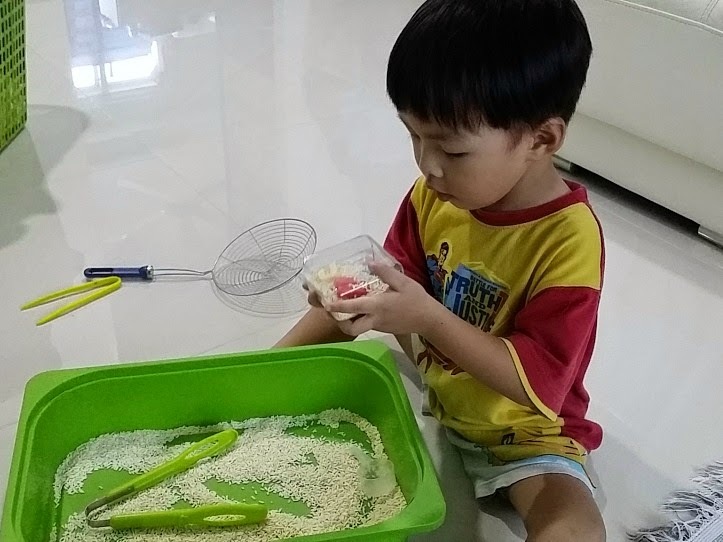 Out of the blue one day, he asked me for his Sensory Bin to play with. 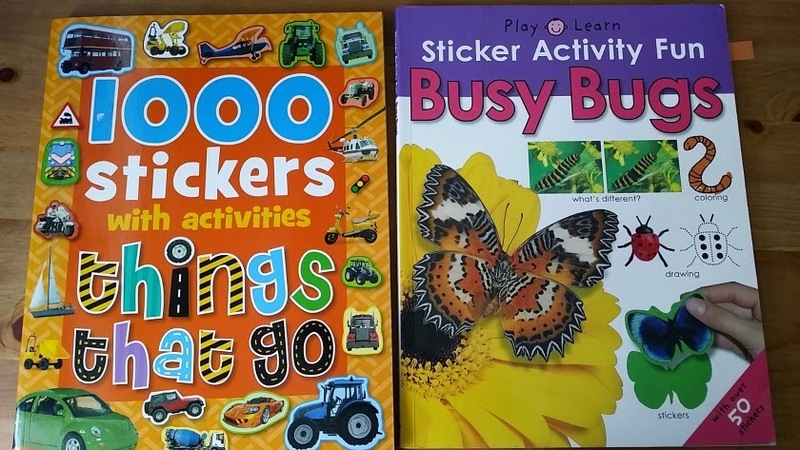 That's been put aside for some time on a high shelf (out of sight and out of his mind, I was hoping), but since I was preoccupied with tutoring RM I thought that would help to keep him busy. And it did! For more than an hour, and that's saying a LOT. Although I had to do quite a bit of cleaning up after him. 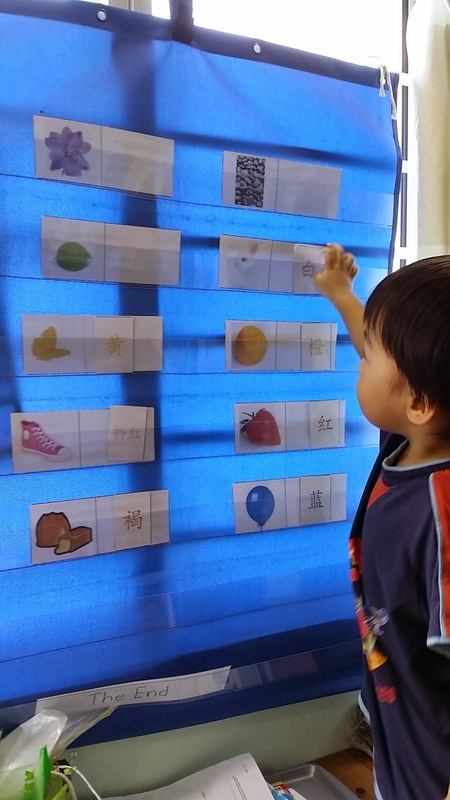 Browse my Pinterest Boards for more Kindergarten, Preschool and Tot ideas! It feels good to be back on track. I tried to cover more this week and to spend more time out of lesson hours playing and reading with him, as I am anticipating the next two weeks to be rather taken up with revision and tutoring RM for his mid year exams. In step with our "two units a week" plan, we covered You Can Read Units 7 and 8. 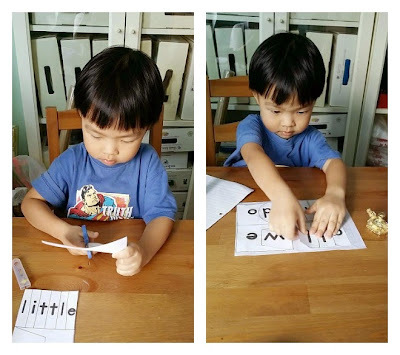 Mouse already knows what to do with each activity, so I only have to teach him to sound out the words as an introduction, before handing him one sheet at a time. 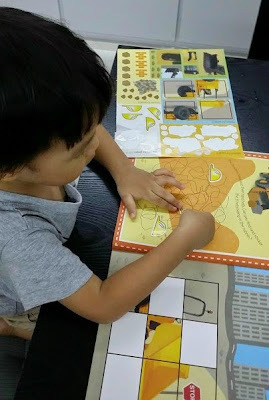 Patterns: Mouse is pretty good at following simple patterns so I encouraged him to take the next step of creating his own with this free worksheet from This Reading Mama. He quickly grasped the concept of A, B and C each being it's own repeating entity and did the rest on his own. 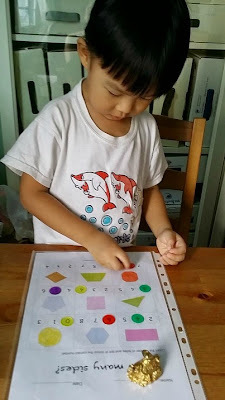 Shapes: Learning to count the number of sides to a shape. I created a worksheet for him, based on a similar one which I found on Pinterest but which was a paid product. My skills aren't up to par at all, so it took me quite some time to complete the worksheet, but I'm glad I did! 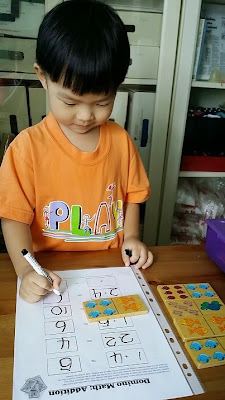 Subtraction: After practising Addition for a couple of weeks, we are moving on to Subtraction. Actually I think it's easier to understand than Addition. 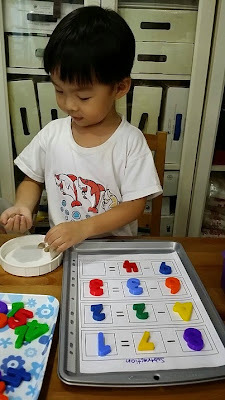 We are using a cookie sheet addition and subtraction printable that I found years ago (when RM was 6yo) which says "childcareland.com" in the corner, but I can't find it on the site now. We used number magnets on a cookie sheet and I also provided pebbles for him to count. This week I'm sharing two of the pages in Mouse's Daily Notebook. Unlike his character writing practice sheets that I swop out every week or fortnight, these pages always remain in his notebook and he must do them every day. 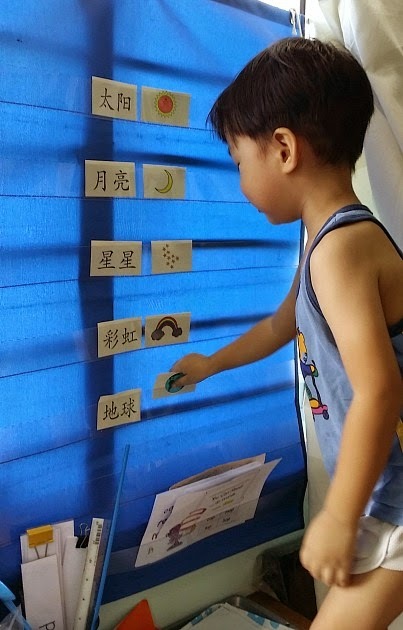 He started out doing the English ones that I got from COAH and 1+1+1=1 first, then somewhere along the way, I introduced the Chinese version, and since he's already rather masterful at reading the bilingual desktop calendar that's on his table, he usually has no problem completing these. 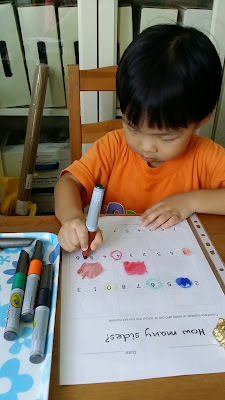 With the help of a dry erase marker, he circles each day and the day before and after, much like this page from 1+1+1=1. The second page is a Month page, where he identifies the current month and the previous and subsequent ones. The pages are in sheet protectors and are erased by either himself or me after the book is completed. I was digging around in his bookshelf where I had dumped (and forgotten about) many reading materials as well as sticker/write and erase activity books (am I the only mum who buys them waaayyyy in advance and forgets all about them?). So here are two that seem rather suitable now. I can't reiterate enough how much Pinterest has helped me in my homeschooling journey. There are just so many great ideas that I am thankful I can Pin them and go back anytime I want to read up or print stuff. Visit my Pinterest boards for more ideas! We were unable to cover as much as I would like to have, because Mouse's older brother Roast Meat was unwell and home on medical leave. We spent a couple of mornings (always the best time to school) at the doctor's and only managed to do some work in the afternoon or evenings when I didn't have to cook or complete other work. It's fulfilling to know that Mouse is learning more and more words, and he really does take to them like a fish to water! We did You Can Read Unit 6 as well as the -IG word family unit, both from 1+1+1=1. I should mention that, although the units include several different activities to reinforce the learning of the words, we do not use all of them as he is resistant to some stuff such as colouring and lots of tracing or handwriting. To keep him interested, I only print off one or two writing practice pages, one each to be used on each of the two days we cover that unit. 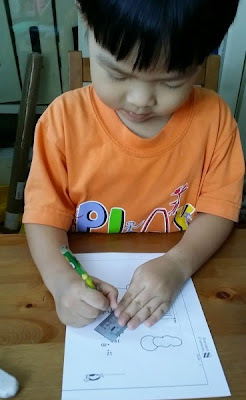 He much prefers using stamps, Do A Dot, and tracing shapes. In his daily notebook (that he has to complete every school day at the start of lessons), I included another sheet of sight words. 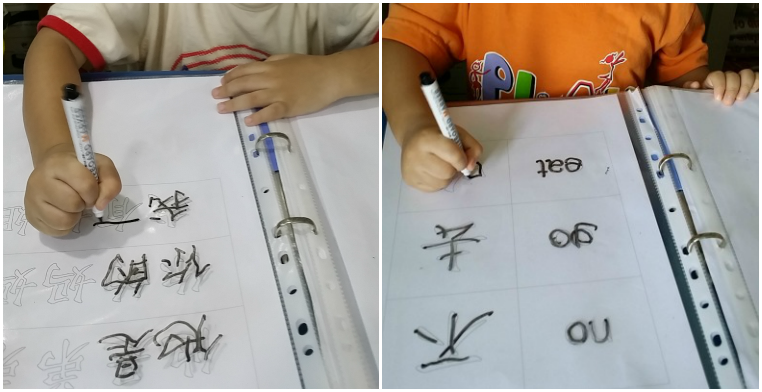 I teach him the order of strokes (although he's already able to guess them by now) and remind him to say each stroke out as he writes them. 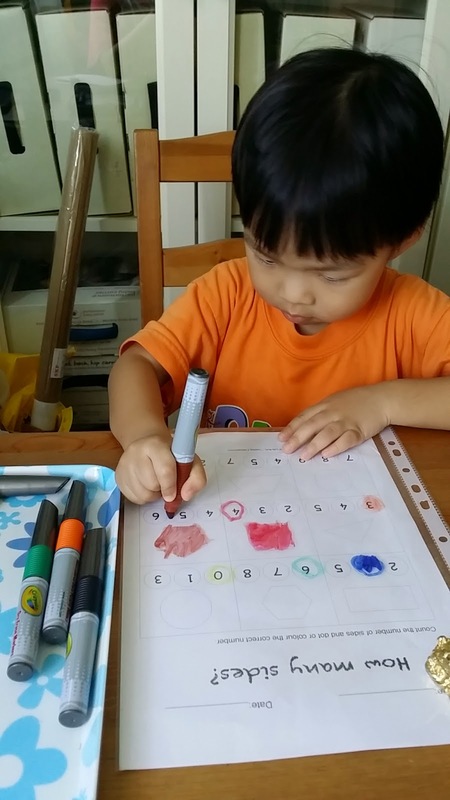 We also revised the Chinese names for colours with this set of cards from Parentingjoy. 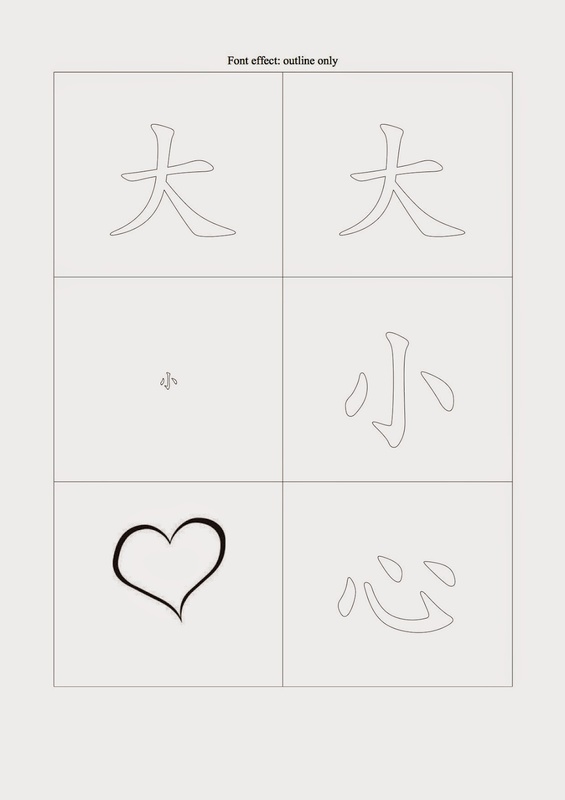 I will be making a tracing practise sheet for colours soon (after RM's exams are over). We are using various Addition printables from around the web to practise and reinforce the concept. This week, we used this Domino Math printable from COAH. 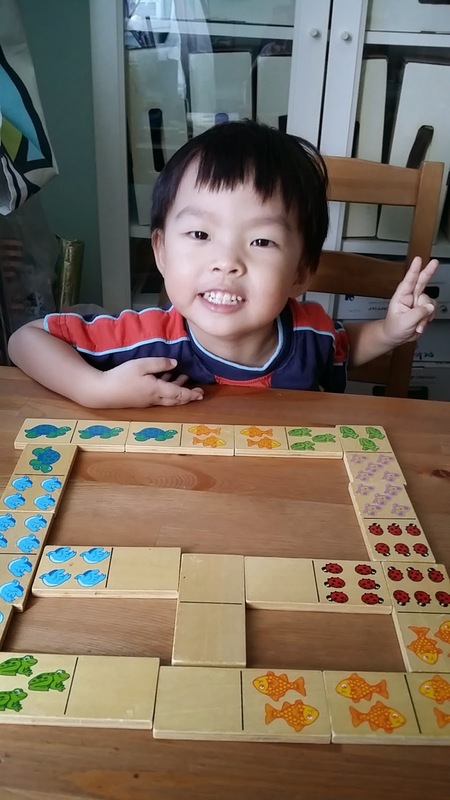 First, I had him select a domino (from Melissa & Doug that we bought years ago at ToysRUs) and dot the equivalent number of animals on his sheet. 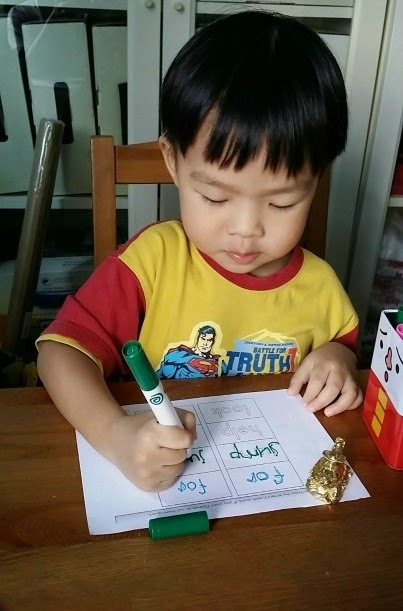 He had to count all the dots and write the total in the answer box. 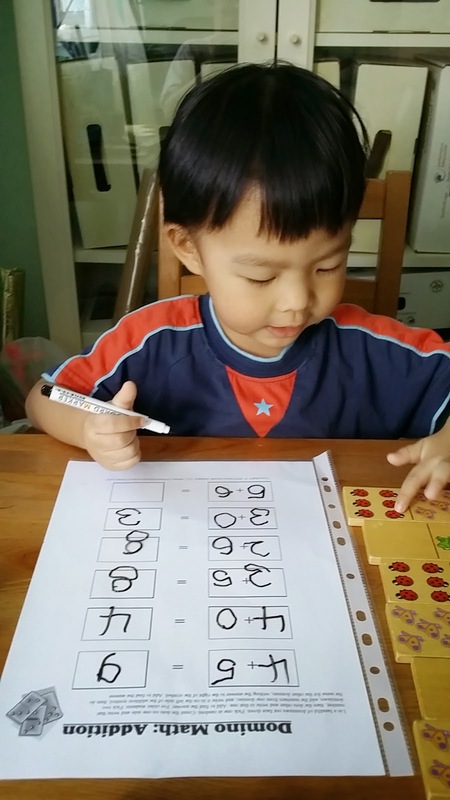 Then he picked a fresh set of dominoes and wrote the numbers on the sheet. I tried encouraging him to count on eg. 5+2 "start with five, then 6, and... 7" but he still prefers to count ALL the animals from 1. This needs a lot more reinforcing and encouragement. After that we just had some fun with the dominoes, matching them end to end. 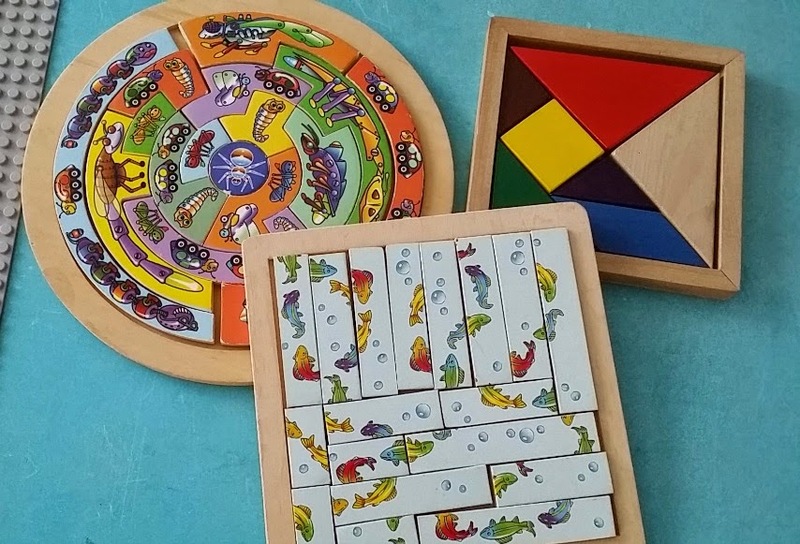 One evening on a day where we didn't have any lessons because of going to the doctor's and bringing Mouse for compulsory vaccination, I took out some Melissa&Doug puzzles nobody has touched for a long time. He liked the fish one, which, although challenging, he discovered the trick to matching (under some guidance *cough cough*) and joined most of it up himself the first time. Subsequently, he was completely on his own. And we had a set of 3D puzzle blocks nobody knew how to solve so he just used them to build a wall. I sure hope next week we can go back to our regular schedule! We are moving along faster now with the You Can Read series from 1+1+1=1, and are able to complete two units in one week. Each unit takes us about two days to complete. 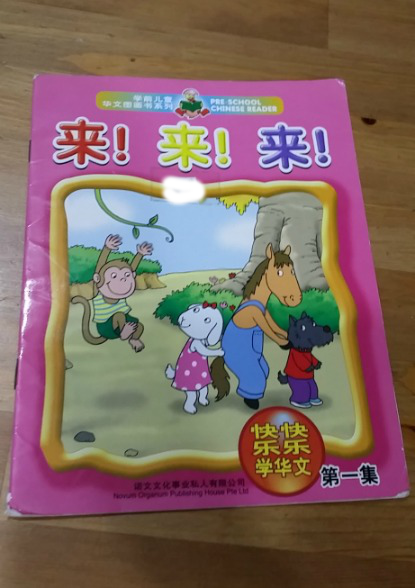 Actually we can finish in one day, but I prefer to cover more than one subject per day, and completing the second half on another day helps to recap and reinforce the lesson. I don't have any pics but we did Units 4 and 5 this week. 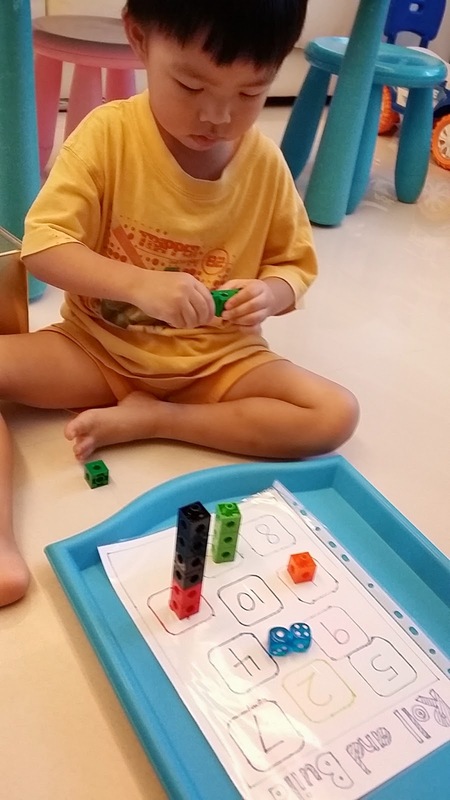 Pinterest is a valuable source of ideas and resources for me in my curriculum planning, and while browsing around, I found a very interesting activity which involves rolling dice (one of Mouse's favs) and building with cubes (which I like). The original did not have a free printable so I drew one up for Mouse. 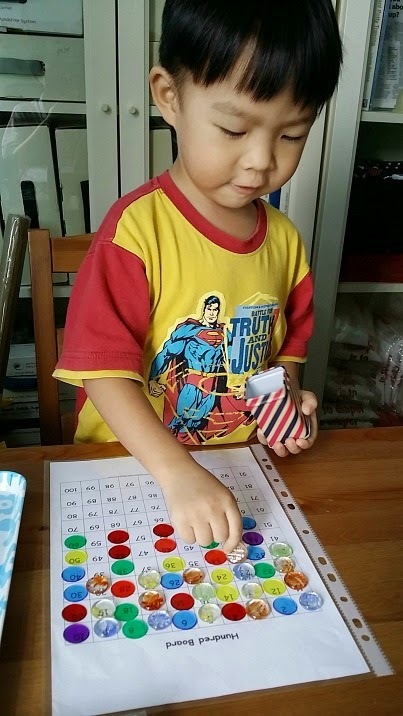 Just roll two dice, add up the dots and build the corresponding number of snap cubes on the sum. I am using these readers from my older kids' kindergarten days (they went to a church kindy). 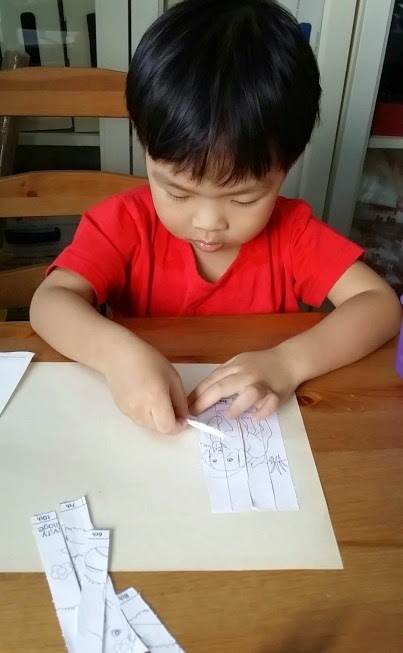 We've been reading them together for the last couple of years, but now we're earnestly into learning I'm also drawing up some simple Literature based activities for him. To begin with, in his Daily Notebook, there are always a couple of pages of Chinese characters for him to practise. I used words that he would be familiar with from the books. And here he is sequencing the story on our pocket chart with the word cards. Here are this week's character writing practise sheets. 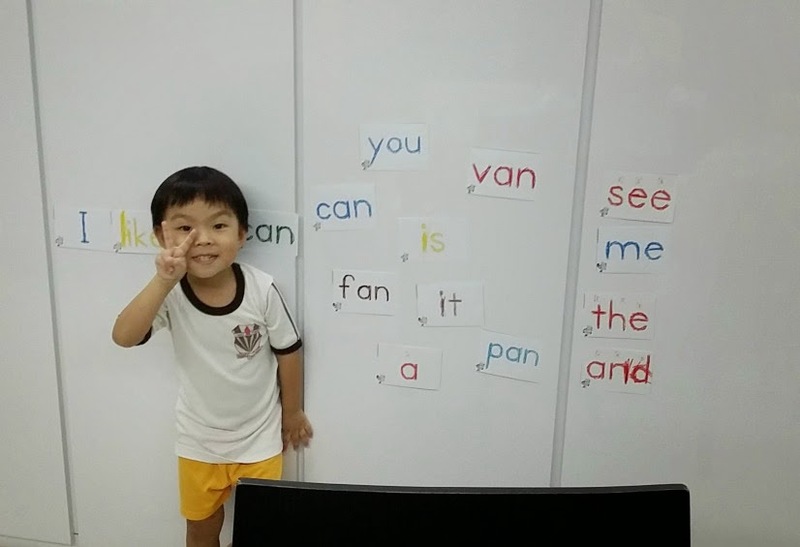 This week, our focus has been on the Word Family for -AN, since he already knows CAN. 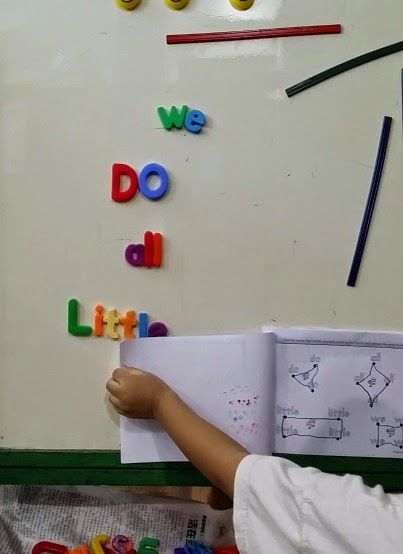 I was worried at first that he wouldn't be able to catch onto the technique for word families but after demonstrating a couple of times by sounding out the first letter, he got it. I have often heard him sounding out the first consonant on his own. We are using the free printables for -AN family from 1+1+1=1. Here is our updated Word Wall with word cards from the -AN unit added. 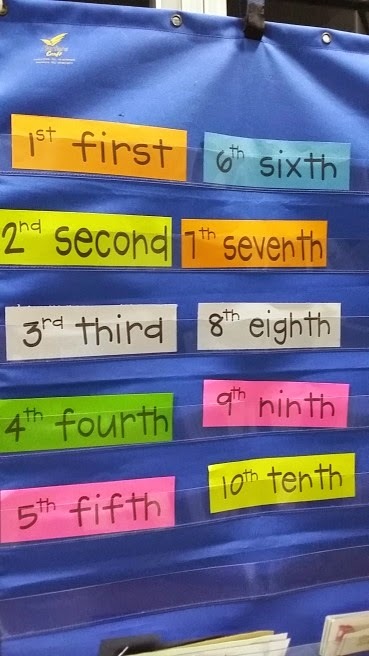 We started working on Ordinal Numbers. 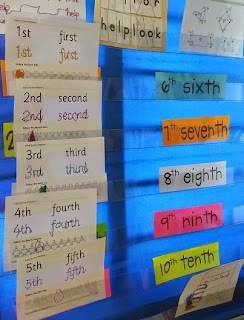 I found a lot of worksheets on Pinterest, and a colourful printable that lists the numerical form and word form on a pocket chart. 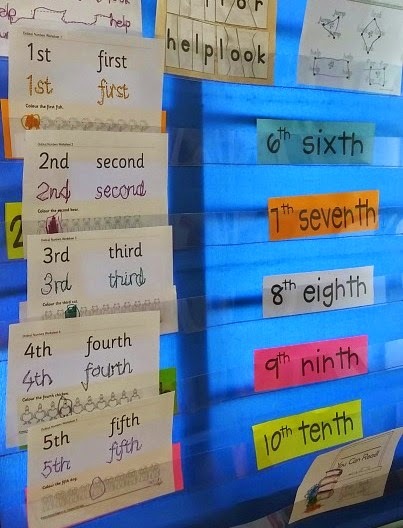 Unfortunately, as our hanging pocket chart is the standard type, I have had to split the numbers into two columns. 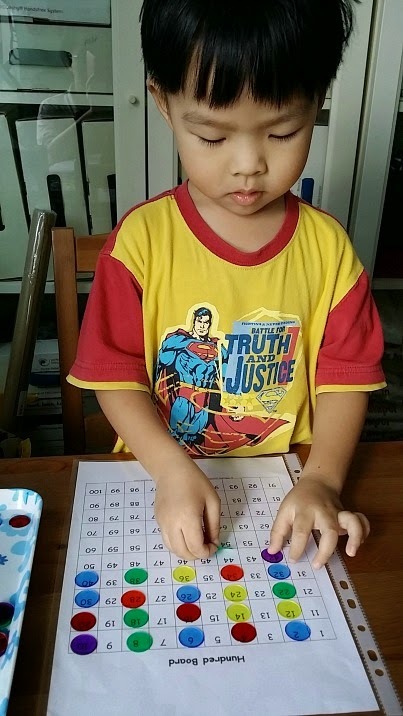 It took him a little time to understand the meaning of the ordinal numbers, and I had to prompt him quite a lot to work out the answers in the worksheets. We will be doing more to reinforce the concept next week. Mother of three who enjoys (most of the time) being a WAHM. Almost-regular bento'er and regular ranter. Answers to "Militant Breastfeeding Mum" amongst other complimentary and desirable names.